Lately with every version of Office Microsoft seems to be making it more and more difficult to perform tasks that were previously simple. and you expect an I bar to appear to allow you to edit the address. That doesn’t work – you notice that the cursor is an arrow, so you think OK maybe it works like other Office Apps: Excel, Word – maybe I have to tell it I want to “Edit” the cell. There’s a keyboard shortcut of F2 for that in other Office apps so you try that and nothing happens. Then you realize you can double-click the field. So you try to click on the e-mail address here, but realize that just opens a new e-mail. But that is NOT what you want to do. By now you’re getting pretty frustrated. You just want to edit the damn e-mail field and type ONE extra character to fix your typo. 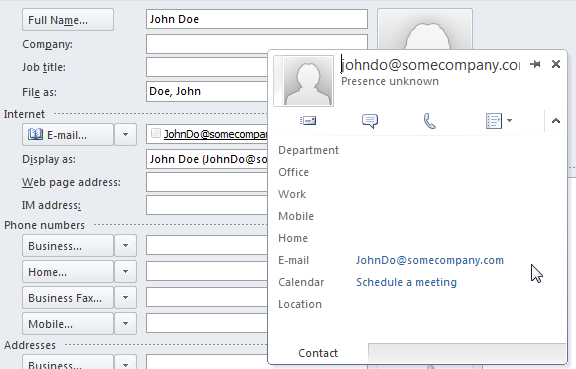 Click the little drop down menu on the right side of the dialog, choose Outlook Properties. A screen appears that allows you to edit the darn e-mail address. 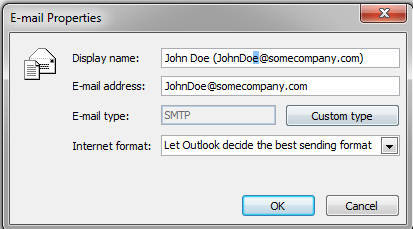 But unlike previous Outlook versions, after editing the e-mail address it doesn’t automatically also update the display name, so now you have to make your correction in two places – on both the E-mail address line AND on the Display name line. 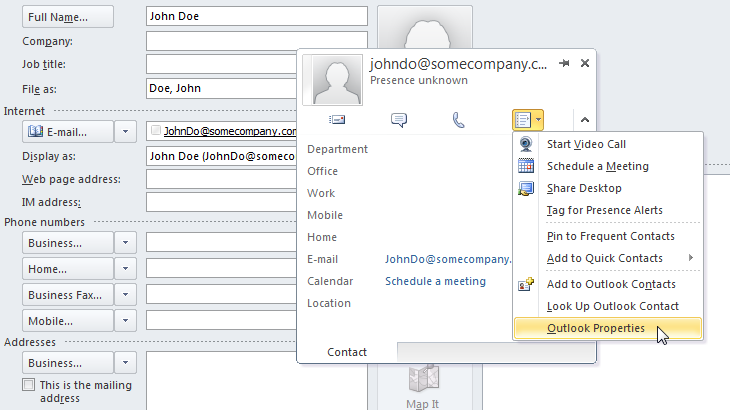 In Outlook 2013 this is made even worse. I don’t understand what happened to Microsoft’s usability labs. They used to pride themselves on having real end users spend hours using the software and incorporating that feedback into products. In recent years though product usability seems to have taken a back seat to other objectives, some of which are helpful, but some of which make previously simple tasks ORDERS OF MAGNITUDE more difficult and LESS DISCOVERABLE than ever before. 1. Double click e-mail address. 2. Click on Drop down. 4. Click in E-Mail address field and make correction. 5. Click in Display name field and make correction. Why do simple things have to be so much harder to do? Yes – Microsoft has lost a lot of their easy items and made them so much harder. Not only in email but excel formulas. So thanks again, you saved me tearing out any more hair. I’m moving to Apple slowly after being so fed up with similar stupidities. Mind you, hard to believe, but Adobe are even worse and I can’t really find an alternative for Photoshop/Flash. Finding this extremely frustrating at the moment. Surely editing an existing email address in an email is not some exotic corner case – for anyone in a helpdesk or general communication situation, it happens all the time? 4) Select the “Display as” field (it will automatically update with the new address). 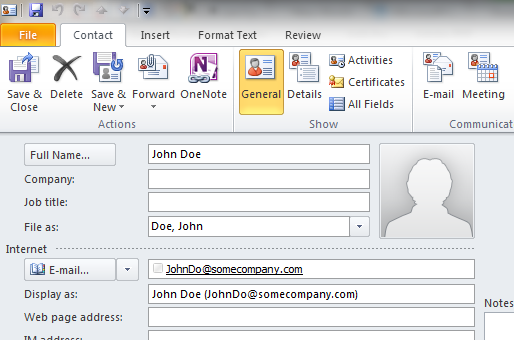 all that to change 2 letters in an email address – good on ya micrsoft. Thank you for the Blog, exactly what I needed! Thanks for making me laugh out loud. And for helping me solve the conundrum that had vexed for me for far longer than it should!